This card is constructed from a White 100# tagstock. 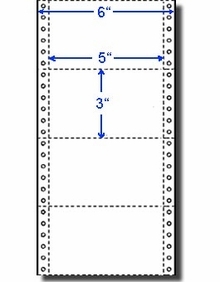 4,000 Compulabel® 210150 5" x 3" Index or File Cards, Continuous, Pin Feed for Dot Matrix and other Impact Printers. Overall width is 6", and Fan Folded every 12". This is the 2nd time ordering this item and theres a reason for it. We use these labels specifically for our inventories. no other place (that i could find) has these and for a great price and are excellent quality. i will be back next time for more!